Although Roronoa Zolo’s life hasn’t been the whirlwind of tragedy that many of the other Straw Hats have had, I still firmly believe that he is the crew member that best represents rage, which is the emotion tied to red light, and here’s why: According to Wikipedia, rage is a mental state that is one extreme of the intensity spectrum of anger, which is usually induced by a threat of some sort. When a person experiences rage, it usually lasts until the threat is removed or the person under rage is incapacitated. Rage can sometimes lead to a state of mind where the individual experiencing it believes, and often is capable of doing things that may normally seem physically impossible. Zolo is not a character purely driven by rage but more of a disdain towards his situations and interactions with people and I think this stems from a past issues that he’s yet to overcome. As many of you may recall, when Zolo was first training to become a swordsman, he befriended a young girl who pushed not only his buttons but his limitations and belief in his own ability. She became the perfect catalyst for the growth of Zolo’s potential but unfortunately, met with an untimely end, prompting Zolo to make the promise to become the worlds greatest swordsman in her honor. This character motivator is wonderfully complex. One on hand, it gives him honest and compelling justification towards his actions, making the reader feel more connected to the character, as he becomes closer and closer to achieving his goal. It allows the character to shine when he takes this step forward but when he gets set back, well that is a horse of a different color (sorry, really wanted to use that) Zolo, despite his notable victories, has been put in his place on a number of occasions. During his first encounter with Mihawk, he is devastated at his loss and nearly perishes because of it. Similarly, he is irked by the chance meeting with Tashigi, who bears a strikingly similar image to his long gone friend. What I am getting at, is that as much as this promise drives Zolo, he has essentially haunted by it and when he lacks to the ability to achieve his goals, it drives him to madness. I didn’t use the standard white shirt, haramaki and black pants outfits because to be absolutely honest, I find it really boring. 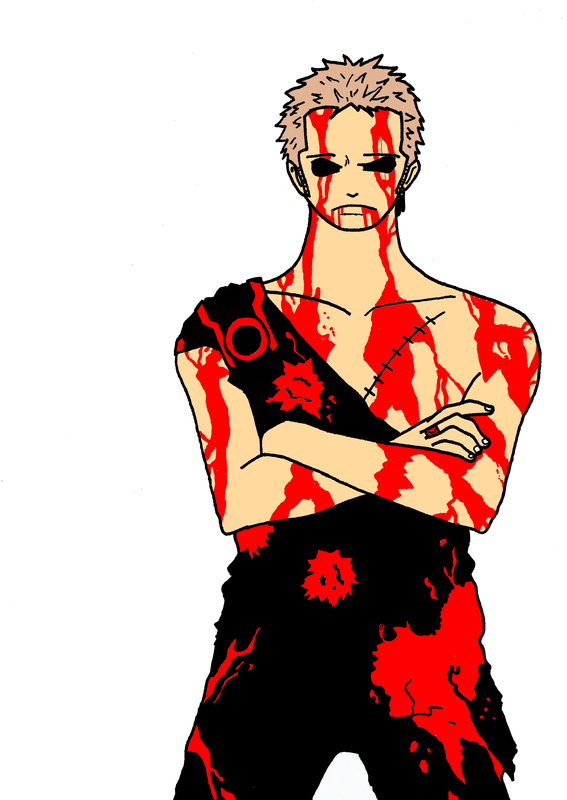 I was really struck by a picture of Zolo, post battle, with his outfit torn and his body covered in blood. He looked defeated, hurt and like he was quietly building his rage to counteract this wrongdoing. So I took that, reformed his outfit to a toga-esque (but with pants) outfit and went “blood-crazy” with it. It’s interesting because the outfit is so unsophisticated that it really speaks to the nature of rage; that it is a baseline human trait. The blood is on Zolo’s hands and its a fine color. It symbolizes the life and vitality that is in Zolo, covering his whole body to further emphasize the point that he is ready to take action. Red is also sometimes used as a color to protect us from our fears, because of its very bright intensity and associations with strength, which can also be interpreted here. As serious as this design is (blood stains on a black outfit. my lord), it is very energetic in a powerful, almost scary way. I had a lot of fun designing this outfit and this might be my most original piece in the collection. I wish I was better at doing the blood stains though. A powerful image, and you had to use an image from Thriller Bark.. that part had me crying for a bit.